HPLC is by far the most common analytical technique used for metabolite profiling due to its versatility, relative ease of operation, and the broad spectrum of metabolites that can be determined directly. Basically, HPLC is an integration of a separation and detection system working with separation in a liquid phase. Metabolite profiling using HPLC is almost always done using gradient elution on reversed phase material (C8-C18 phase or similar) with polar mobile phase. The most widely used mobile phases are water-acetonitrile or water-methanol containing some modifier, e.g., tri-fluoroacetic acid (TFA). The flow rates used for metabolite profiling depend on the columns, but in general analytical columns with diameters between 2 and 4 mm are used at flow rates from 0.2 to 1 ml/minute. Smaller diameter columns will give a better separation at the cost of lower absolute sensitivity, as a smaller amount of sample can be injected. As described in the introduction to this section identification of fungi from metabolite profiles can be done either by detection of specific metabolites or by using the full chromatogram as a profile. 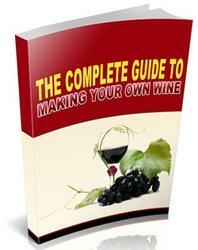 In both cases it is important to keep the analytical conditions as constant as possible. In the first case, the identification of metabolites can be determined from the retention times used together with standards. Possible spectral detection is described later. The effect of small, unavoidable shift, in retention time over time can be reduced by using a series of alkylphenones to calculate a retention index for each peak in the chromatograms (Frisvad and Thrane 1987). If the full profiles are to be used constant analytical conditions will reduce the alignment needed (Nielsen et al. 1998; 1999). In cases of metabolite profiling, detection of compounds eluting from the HPLC column is mostly done by UV detection, fluorescence detection (FLD), or MS. The UV detection accounts for the majority of the applications, however there is currently considerable growth in the use of MS (see section 3.4). In classical HPLC, compounds are detected by measuring the absorbance of the column eluent at a specific wavelength. The chromatogram [e.g., plot of absorbance vs. time] shows peaks representing the compounds eluting from the column. This technique requires that the compounds have a chromophore that absorbs light at the selected wavelength and that the solvent is transparent (or at least does not have any significant absorption). Fluorescence can be measured with a selected pair of excitation/emission wavelengths in a similar fashion, if the compounds have a fluorophore. Several mycotoxins have distinct fluorophores, whereas others can be derivatized prior to detection. Identification of fungi can in some cases be achieved by identifying a set of specific metabolites produced, regardless of the analytical method. This requires that relevant metabolites to be identified with high certainty, and usually requires either use of an authentic standard and/or several spectral and chromatographic techniques. Spectral detection by a UV-spectrometer (DAD or PDA) is commonly used as these techniques greatly enhance the information available by providing structural information about each peak (compound). 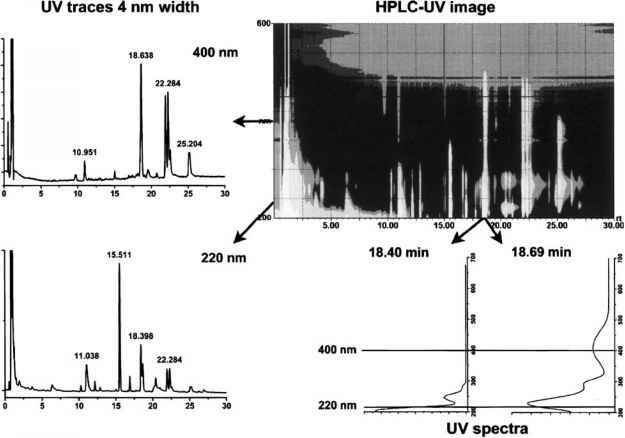 In HPLC-UV detection, a UV-spectrum is collected at regular intervals in such a way that between 10-20 spectra are collected across a chromato-graphic peak. The resulting data file is illustrated in Figure 5 and it is important to understand the structure of these files to fully exploit the data of a full HPLC-UV chromatographic matrix. The chromatographic UV-traces at selected wavelengths are present at the time axis and a UV spectrum is present at a specific retention time. The full data matrix can be visualized as a chemical image of the sample and can also be used for fungal identification without identifying the metabolites (Nielsen et al. 1998; 1999; Thrane et al. 2001). Figure 5 shows that quite different looking chromatograms can be obtained from the same sample by selecting different wavelengths. This feature can be used to enhance the chromatographic resolution and to find specific metabolites, e.g., viomellein is at 18.69 minutes on the 400 nm trace in Figure 5 and overlaps with puberuline at 18.40 minutes on the 220 nm trace. These traces are all profiles of the sample and as such can be used alone or in combination, or to aid specific detection. As quantitative detection is based on Beers law it is necessary to use the same wavelength for quantifying standards and unknowns for each compound but it is not necessary to use the same wavelength for different compounds. Identification or characterization of compounds can be achieved from UV spectra if the compound has a characteristic chromophore structure (bond structure typical containing p-electrons systems), e.g., xanthomegnin, which is two anthraquinone systems, has a chromophore giving an absorption maximum around 410 nm. This is fortunately the case for many fungal metabolites but not for all (Cole and Cox 1981). The combination of retention time or preferably the retention index and a characteristic UV spectrum is quite reliable for identification of many fungal metabolites (Frisvad and Thrane 1987; 1993), however standards are needed for confirmation. The use of UV-spectra in combination with other detectors, e.g., FLD can greatly enhance the specificity. Figure 5 The HPLC-UV data matrix showing both information about composition in form of chromatographic traces and structural information in form of UV spectra. Analysis of a plug extract from Penicillium cyclopium, IBT 16932, grown on CYA collecting approx. one spectrum/sec, with a resolution of 4nm. For identifying fungi, it is not necessary to know the identity of all of the components in a chromatographic profile. If a peak has unique features in terms of retention time /index and chromophore it can be designated with a code and used along with the metabolites known from a particular species. The most efficient identification can be done if metabolites are grouped in chromophore families (known and unknown compounds), as compounds with similar UV spectra often belong to the same bio-synthetic pathway. Therefore, if just one member of a chromophore family is present it can be used as indication of that particular pathway is active in a fungus. Ochratoxins can easily be detected in the two penicillia, P. nordicum and P. verrucosum as well as in A. ochraceus and Petromyces alliaceus where they are good species markers. They can be detected using HPLC with UV detection with full scan UV spectral confirmation. 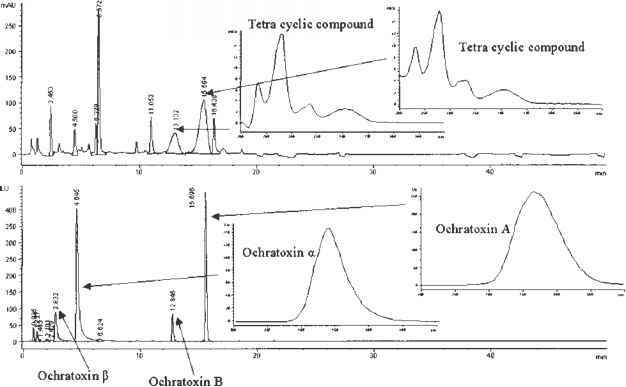 However, in the A. niger complex, the two ochratoxin producing species A. niger (only 6% of the isolates produces ochratoxins) and A. carbonarius produce many interfering components that elute across the whole chromatogram (Figure 6) and obscures ochratoxin detection. The FLD gives a very high specificity and sensitivity (1-20pg on column), with the possibility of obtaining full scan fluorescence spectra. This is illustrated in Figure 6 where an A. niger isolate has been analyzed by HPLC with simultaneous UV and FLD, ochratoxins A and B are hidden in the UV chromatograms under peaks of tetracyclic components. The simultaneous detection of all ochratoxin analogues (a, b, A and B) serves as an extra confirmation.